Driving through the Dordogne on a sunny November day highlights the autumn colours of the vines: varying shades of gold, russet and brown which signal the twilight of the wine season for the year. This day we are driving to Périgueux to attend a gathering of Confréries at the pâté de Périgueux competition. 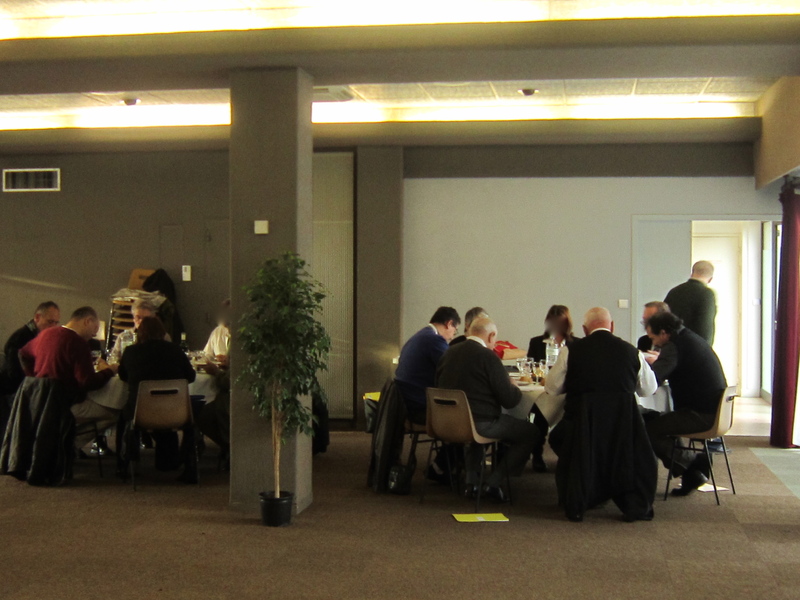 When we arrive the judges are busy tasting the pâtés and forming their opinions. Its tense work and important for the pâté makers of the area. The results are delivered at a ceremony in the market square later in the morning. 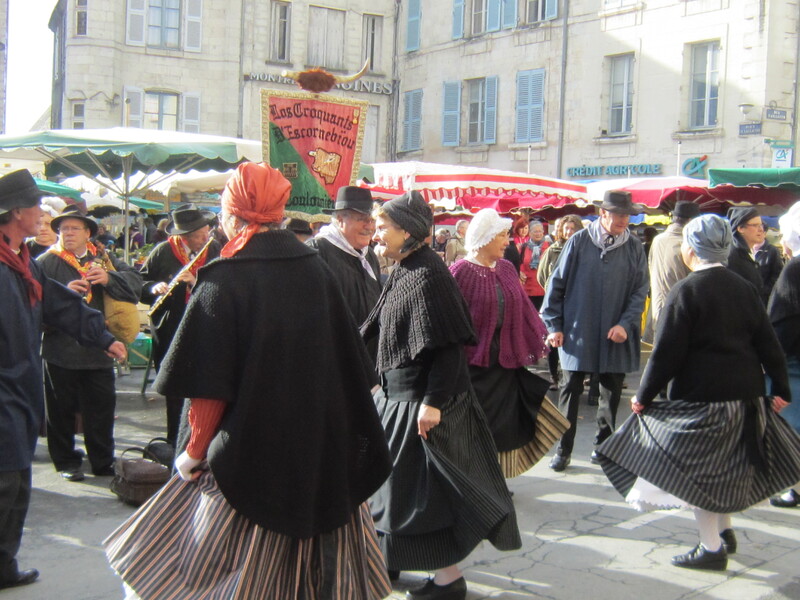 In the meantime, the Confréries, the local voluntary organizations with historic origins that promote the region and its gastronomic products such as wines, cheeses, pâtés, strawberries parade through the streets in the old town of Périgueux They are preceded by musicians and folk dancers who entertain people going about their regular shopping in the markets. After the results of the competition are announced in the market square there is a tasting of the pâtés accompanied by white wine. This is a 2012 Côtes de Bergerac Moelleux from Chateau Court-Les-Mûts. We know the red wines from this winemaker but aren’t so familiar with the whites. The fruit aromas of this lightly sweet wine make it an excellent complement to the pâtés. After the ceremony in the square, we are fortunate to attend a lunch which highlights the gifts of the terrain including pâté, foie gras, mushrooms and truffles. My favourite dish was the starter of Pâté de Périgueux en Croûte served warm with a truffle sauce. 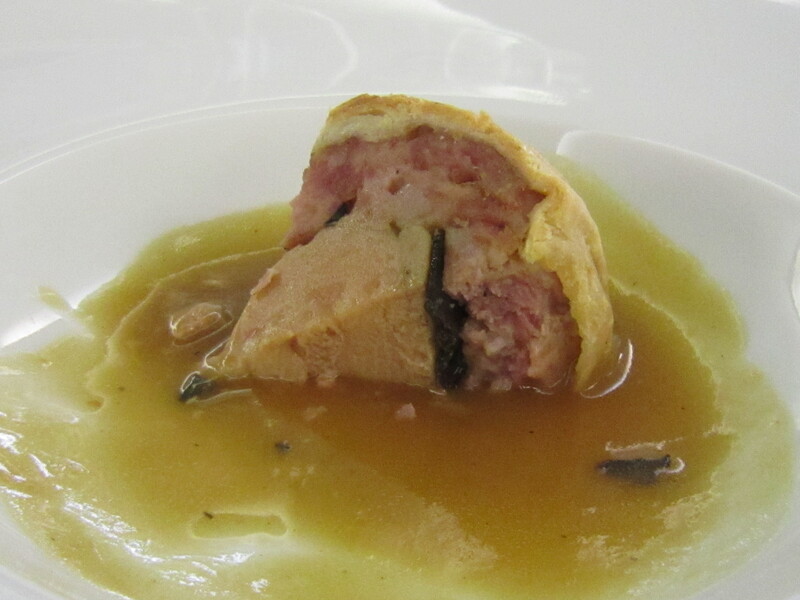 The small amount of foie gras in the middle of the pâté was balanced by the pastry and the sauce. A late harvest Monbazillac wine was on offer. The late harvest wines are frequently paired with foie gras. However, this day we enjoyed the Pécharmant red wine: Domaine de l’Ancienne Cure, Jour de Fruit. A robust, full balanced wine it was a good counterpoint to the richness of the pâté and foie gras. The Pécharmant AOC area is to the north east of Bergerac. It is a small area known for iron elements in the terrain. Only red wines are produced under this AOC. Predominantly Merlot with Cabernet France and Cabernet Sauvignon, Pécharmant AOC wines are known as robust, well structured and approachable. 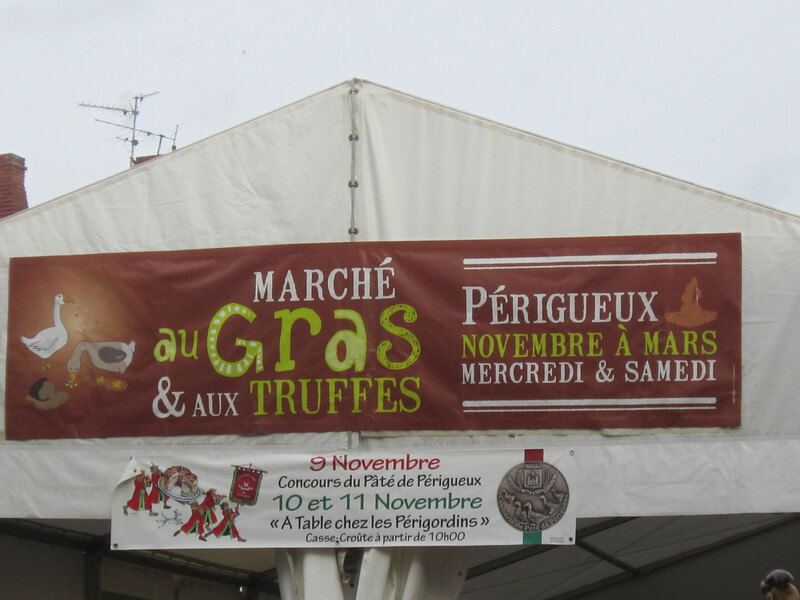 This day in Périguex was a tremendous opportunity to participate in a very special French gastronomic event that gave great pleasure to everyone going about their Saturday shopping in this historic town. 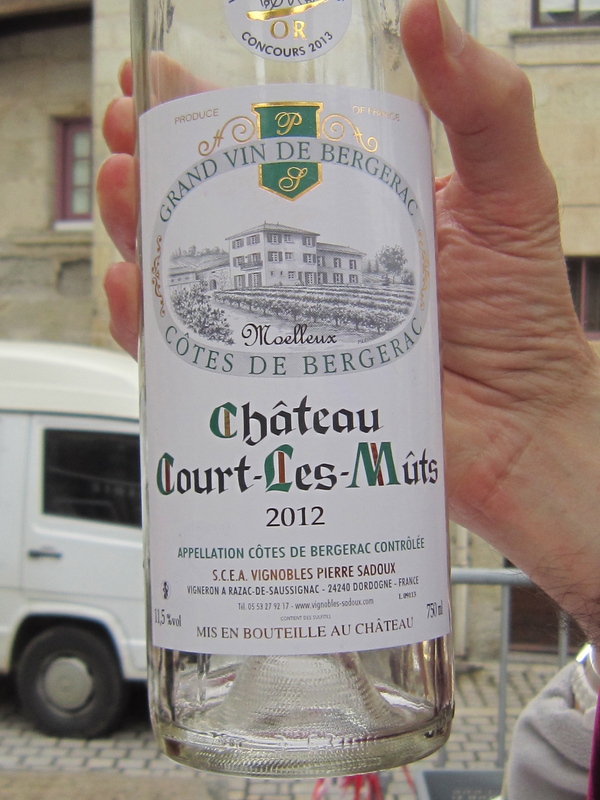 This entry was posted in culture, French Wines, wine and food, wine tasting and tagged Bergerac wine region, Confréries de France, Dordogne, French wine tourism, Pâté de Périgueux, South West France, wine and food pairing, wine tasting notes by elizabethsvines. Bookmark the permalink. Pâté de Périgueux en Croûte served warm with a truffle sauce?? Oh my, this sounds wonderful. Lucky you! Thanks for your kind comments. I will definitely try to replicate this recipe or at least the presentation! An inspiring, mouth-watering post! Brings back memories of a meal in Paris of foie gras accompanied by a beautiful slightly sweet Sauterne. A marriage made in heaven. Your travels through Dordogne and Périgueux sound wonderful. Thanks so much for sharing! Thanks for your kind comments. It was an unforgettable event.